Deep in a winding dusty road in Kiambu, in the midst of endless tracts of coffee plantations, sits Kongo Primary School. We arrive to find pupils relaxing after lunch, with the scorching heat beating hard on them. Five boys are preparing to take part in a race. A teacher beckons us to move closer and within no time he blows the whistle and the bare-footed lads sprint down a dusty road. The teacher informs us that they are taking part in an 800 metres race and after the first round, one of the boys charges forward, leaving his competitors behind. In unison, the pupils begin cheering on the obvious winner, Daniel Maina. But Maina is not your typical primary school student. He is 17 years old and in Class 7. Most of his age mates are in Form Three and will sit the secondary school national exam next year. Not so for Maina, who has had to overcome huge obstacles to even set foot in a classroom. In fact, it is a teacher who learnt of his plight and had him enrolled in school. The tall slender boy, together with his three siblings – two brothers and a sister – are under the care of their grandmother. Their mother ‘lives in Nairobi’ and visits them once in a while. The grandmother is a casual labourer and her wages are not enough for their sustenance. At times, Maina says, they go to bed hungry. But despite his hardships, he is determined to make something out of himself. And he knows that getting an education offers him the perfect opportunity to do exactly that. Every day, he wakes up at 5 am, attends to his morning duties and then, together with his siblings, takes the 30-minute walk to school. Pupils of Kongo Primary School in Kiambu during the music lesson. On weekends, he works at farms around his Matropi village in Mbo-i-Kamiti, Kiambu to earn Sh250, money which he uses to meet school needs and augment his grandmother’s income. Despite free primary education being introduced in Kenya more than a decade ago, many pupils still drop out of school because their families cannot afford uniforms, books and admission fees. According to his class teacher, Ephantus Mburu, Maina is a model pupil – attentive, humble, hardworking and responsible. Not only is he always Position 1 in class, he also excels in field and track games. Last year, he was the best 800-metres runner in Kiambu primary schools’ athletics championship. He went on to represent the county at the provincial level. Maina has a new found passion: music. In 2017, he enrolled in the school’s vibrant music club and he says this is a decision that has changed his life. The club of about 50 pupils meets twice a week. And so after the afternoon lessons, the pupils gather in one classroom to wait for their music teacher, who they tell us, is part of the Ghetto Classics music programme. Ghetto Classics is a community programme of the Art of Music Foundation. The programme, which equips underprivileged youth with music skills is concentrated in Korogocho, Nairobi where more than 300 children are involved. Ghetto Classics has opened and attracted more stakeholders to support the programme such as the Carnegie Hall’s Link Up. Carnegie Hall’s Link Up is an elementary school music programme from the US that pairs pupils with local orchestras. 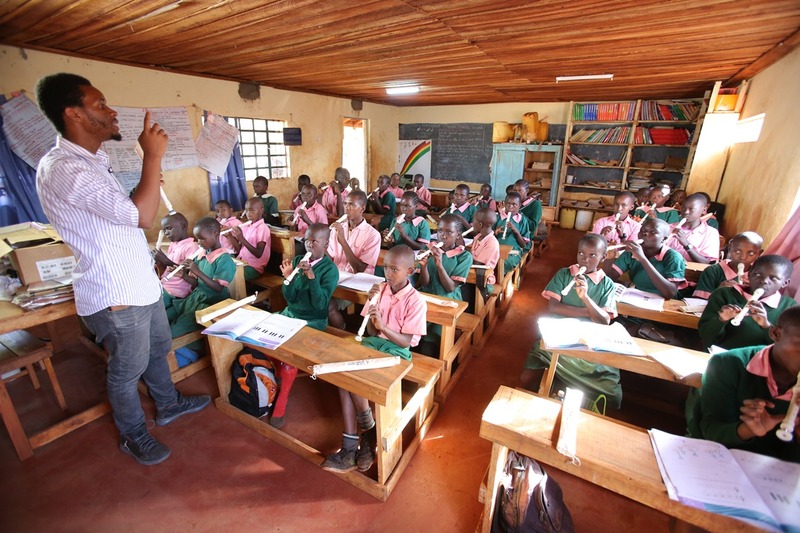 It is through the Link Up programme that Ghetto Classics has managed to expand its operations from Korogocho to other primary schools in Kenya; 10 in Nairobi, one in Kiambu (Kongo Primary School) and four in Mombasa. The benefitting schools are government-run, and most of the pupils come from families with low incomes. It is by this virtue that the Ghetto Classics tutor visits the school twice a week to train the pupils in using a recorder. It was interesting watching the pupils during the lesson trying to grasp the concepts that were being taught. According to Mr Mburu, majority of the students who are learning music have managed to improve in their academic grades. For Maina, it does more than that. “Playing music makes me forget my problems, albeit temporarily. It also helps me keep away from bad behaviour and bad company. Music has also made me more confident,” says Maina. In December 2017, pupils from the school got the rare chance of watching the Safaricom Youth Orchestra perform at the Safaricom Indoor Arena, Kasarani. He says watching his peers perform with such grace and ease spurred a desire in him and he too hopes to learn how to use the bass guitar and saxophone. But for now, he is content with making time for the music lessons, which he believes will open up doors for him to be an acclaimed musician.